Auto UV unwrapping, auto rigging with PBR Material support, pose and motion authoring all in one. 3D Modeling in a blink, try it now! Yes, it's free. And it's cross-Platform, no matter you are on Windows, Linux, or MacOS, the same experience you'll get. Give it a try. 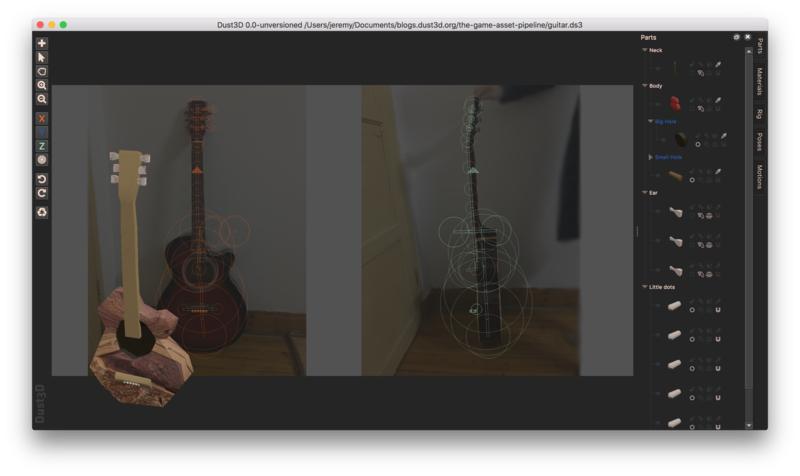 With Dust3D, you'll see yourself finish a game asset in a blink! Dust3D also supports export your model as FBX and glTF format, so that you can then import the files into softwares like Unity and Godot for further development. Read the article here to know the whole process. Believe it or not, you don't need any experiences to make a 3D model with Dust3D, all you'll need are good reference photos. There're more videos on this.